In 2012 Dan Fine started talking to me about a project he was putting together for his MFA thesis. 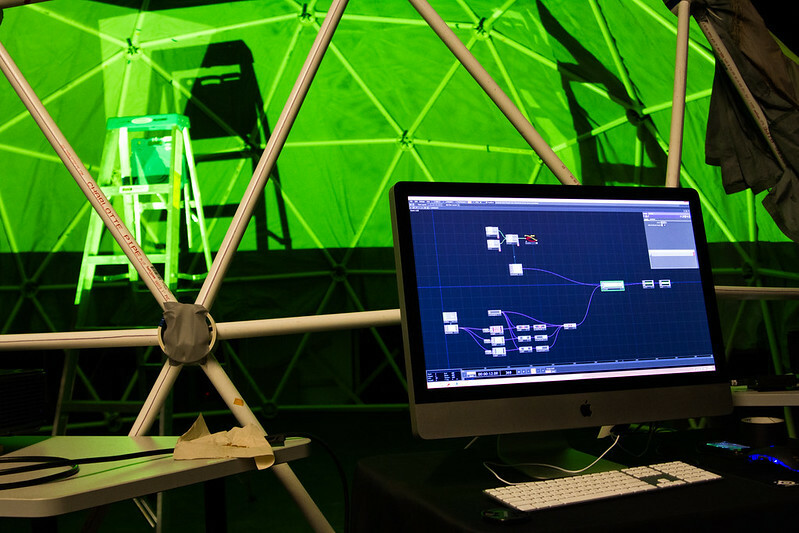 A fully immersive dome theatre environment for families and young audiences. 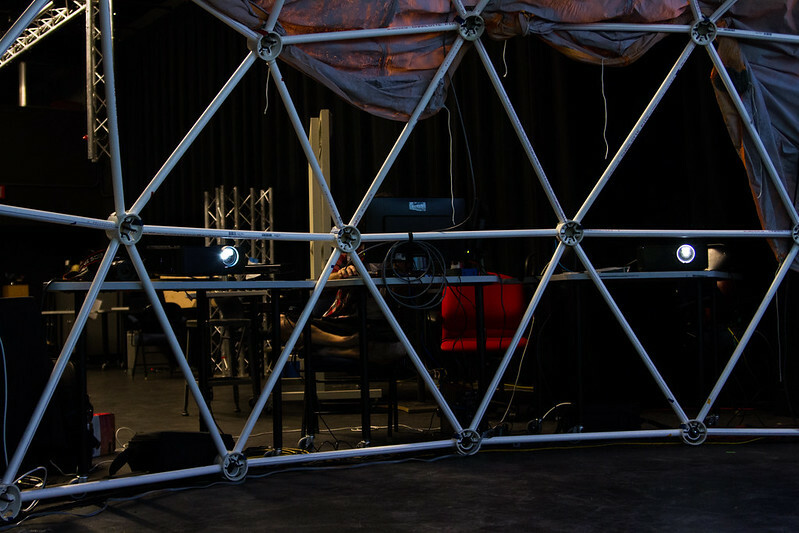 The space would feature a dome for immersive projection, a sensor system for tracking performers and audience members, all built on a framework of affordable components. While some of the details of this project have changed, the ideas have stayed the same – an immersive environment that erases boundaries between the performer and the audience, in a space that can be fully activated with media – a space that is also watching those inside of it. Fast forward a year, and in mid October of 2013 the team of designers and our performer had our first workshop weekend where we began to get some of our initial concepts up on their feet. Leading up to the workshop we assembled a 16 foot diameter test dome where we could try out some of our ideas. While the project itself has an architecture team that’s working on an portable structure, we wanted a space that roughly approximated the kind of environment we were going to be working in. 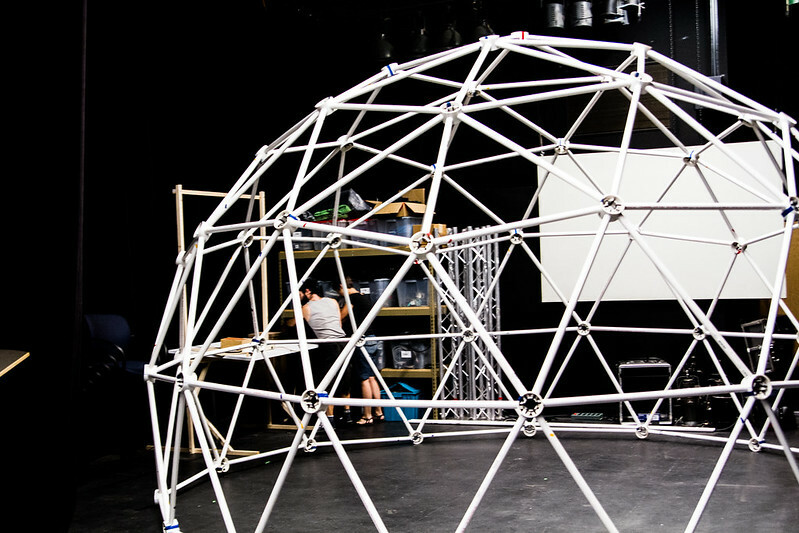 This test dome will house our first iteration of projection, lighting, and sound builds, as well as the preliminary sensor system. Both Dan and Adam have spent countless hours exploring various dome structures, their costs, and their ease of assembly. Their research ultimately landed the team on using a kit from ZipTie Domes for our test structure. ZipTie Domes has a wide variety of options for structures and kits. With a 16 foot diameter dome to build we opted to only purchase the hub pieces for this structure, and to cut and prep the struts ourselves – saving us the costs of ordering and shipping this material. In a weekend and change we were able to prep all of the materials and assemble our structure. Once assembled we were faced with the challenge of how to skin it for our tests. In our discussion about how to cover the structure we eventually settled on using a parachute for our first tests. While this material is far from our ideal surface for our final iteration, we wanted something affordable and large enough to cover our whole dome. After a bit of searching around on the net, Dan was able to locate a local military base that had parachutes past their use period that we were able to have for free. 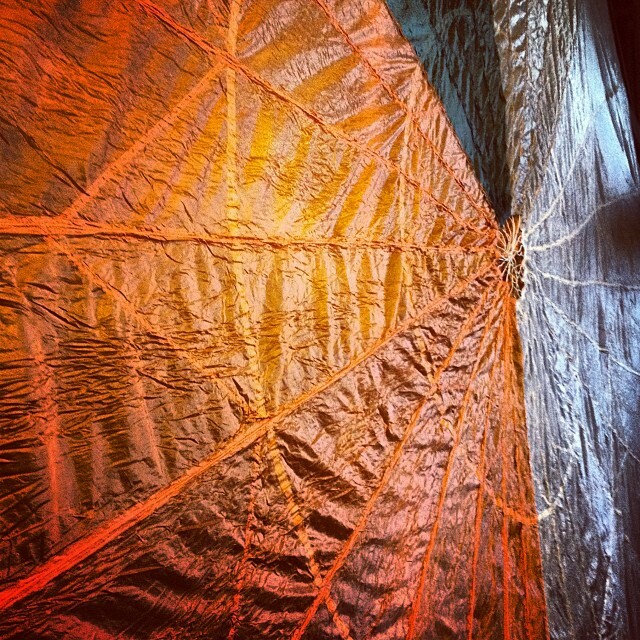 Our only hiccup here was that the parachute was multi colored. After some paint testing we settled on treating the whole fabric with some light gray latex paint. 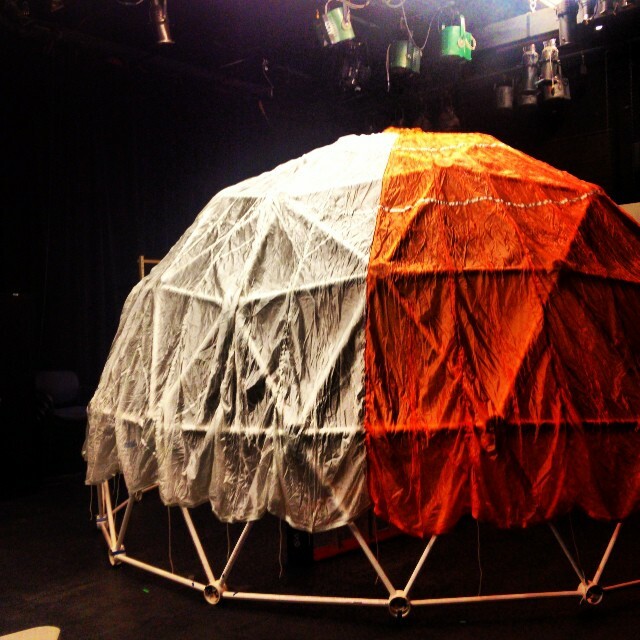 With our dome assembled, skinned, and painted we were nearly ready for our workshop weekend. There’s healthy body of research and methodology for dome projection on the web, and while reading about a challenge prepped the team for what we were about to face it wasn’t until we go some projections up and running that we began to realize what we were really up against. Our test projectors are InFocus 3118 HD machines that are great. There are not, however, great when it comes to dome projection. One of our first realizations in getting some media up on the surface of the dome was the importance of short throw lensing. Our three HD projectors at a 16 foot distance produced a beautifully bright image, but covered less of our surface than we had hoped. That said, our three projectors gave us a perfect test environment to begin thinking about warping and edge blending in our media. One of the discussions we’ve had in this process has been about what system is going to drive the media inside of the WonderDome. One of the most critical elements to the media team in this regard is the ability to drop in content that the system is then able to warp and edge blend dynamically. One of the challenges in the forefront of our discussions about live performance has been the importance of a flexible media system that simplifies as many challenges as possible for the designer. Traditional methods of warping and edge blending are well established practices, but their implementation often lives in the media artifact itself, meaning that the media must be rendered in a manner that is distorted in order to compensate for the surface that it will be projected onto. This method requires that the designer both build the content, and build the distortion / blending methods. One of the obstacles we’d like to overcome in this project is to build a drag and drop system that allows the designer to focus on crafting the content itself, knowing that the system will do some of the heavy lifting of distortion and blending. To solve that problem, one of the pieces of software that we were test driving as a development platform is Derivative’s TouchDesigner. Out of the workshop weekend we were able to play both with rendering 3D models with virtual cameras as outputs, as well as with manually placing and adjusting a render on our surface. 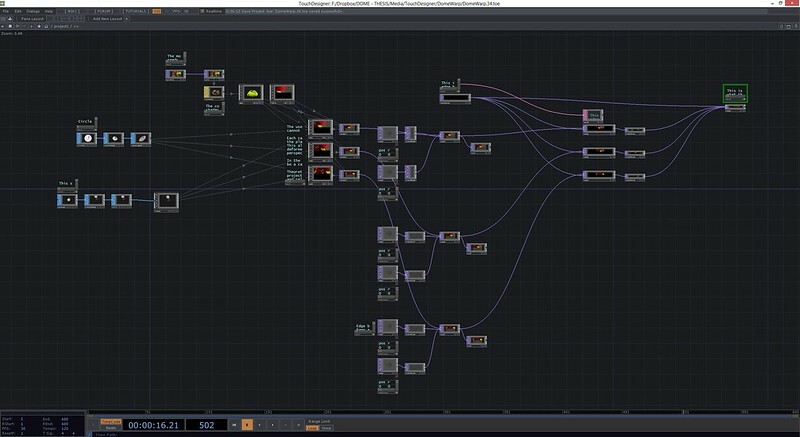 The flexibility and responsiveness of TouchDesigner as a development environment made this process relatively fast and easy. It also meant that we had a chance to see lots of different kinds of content styles (realistic images, animation, 3D rendered puppets, etc.) in the actual space. Hugely important was a discovery about the impact of movement (especially fast movement) coming from a screen that fills your entire field of view. Another hugely important discovery was the implementation of a remote triggering mechanism. One of our other team members, Alex Oliszewski, and I spent a good chunk of our time talking about the implementation of a media system for the dome. As we talked through our goals for the weekend it quickly became apparent that we needed for him to have some remote control of the system from inside of the dome, while I was outside programming and making larger scale changes. The use of TouchOSC and Open Sound Control made a huge difference for us as we worked through various types of media in the system. Our quick implementation gave Alex the ability to move forward and backwards through a media stack, zoom, and translate content in the space. 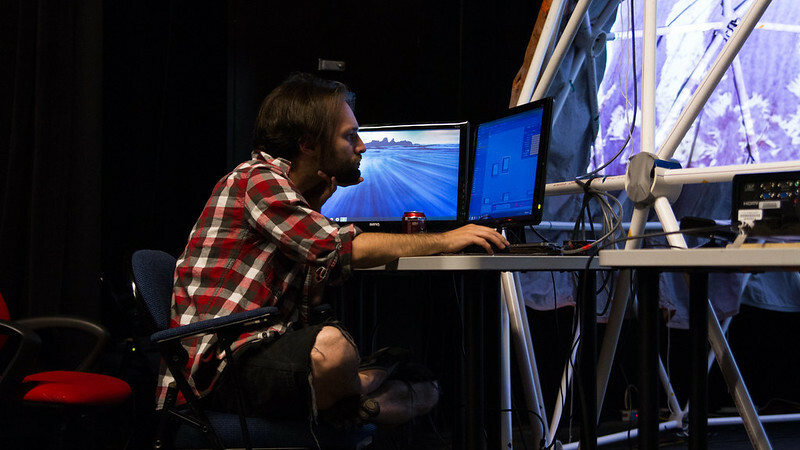 This allowed him the flexibility to sit away from a programming window to see his work. As a designer who rarely gets to see a production without a monitor in front of me, this was a huge step forward. The importance of having some freedom from the screen can’t be understated, and it was thrilling to have something so quickly accessible. While it’s still early in our process it’s exciting to see so many of the ideas that we’ve had take shape. It can be difficult to see a project for what it’s going to be while a team is mired in the work of grants, legal, and organization. Now that we’re starting to really get our hands dirty, the fun (and hard) work feels like it’s going to start to come fast and furiously. What challenges did you find that you expected? The tracking; I knew it would hard, and it has proven to be even more so. While a simple proof-of-concept test was completed with a Kinect, a blob tracking camera may not be accurate enough to reliably track the same target continuously. More research is showing that Ultra Wide Band RFID Real Time Locations System may be the answer, but such systems are expensive. That said, I am now in communications with a rep/developer for TiMax Tracker (an UWB RFID RTLS) who might be able to help us out. Fingers crossed! What challenges did you find that you didn’t expect? The computers! Just getting the some of computers to work the way they were “supposed” to was a headache! That said, it is nothing more than what I should have expected in the first place. Note for the future: always test the computers before workshop weekend! DMX addressing might also become a problem with TouchDesigner, though I need to do some more investigation on that. How do you plan to overcome some of these challenges? Bootcamping my macbook pro will help on the short term computer-wise, but it is definitely a final solution. I will hopefully be obtaining a “permanent” test light within the next two weeks as well, making it easier to do physical tests within the Dome. As for TouchDesigner, more playing around, forum trolling, and attending Mary Franck’s workshop at the LDI institute in January. What excites you the most about WonderDome? I get a really exciting opportunity: working to develop a super flexible, super communicative lighting control system with interactivity in mind. What does that mean exactly? Live tracking of performers and audience members, and giving away some control to the audience. An idea that is becoming more an more to me as an artist is finding new ways for the audience to directly interact with a piece of art. On our current touch-all-the-screens-and-watch-magic-happen culture, interactive and immersive performance is one way for an audience to have a more meaningful experience at the theatre. From the performer’s perspective, I expected to wait around. One thing I have learned in working with media is to have patience. During the workshop, I knew things would be rough anyway and I was there primarily as a body in space – as proof of concept. I expected this and didn’t really find it to be a challenge but as I am trying to internally catalogue what resources or skills I am utilizing in this process, so far one of the major ones is patience. And I expect that to continue. Lastly, directing audience attention in an immersive space I knew would be a challenge, mostly due to the fundamental shape of the space and audience relationship. Working with such limitations for media and lights is extremely difficult in regard to cutting the performer’s body out from the background imagery and the need to raise the performer up. Honestly, the issue of occlusion on all sides had not occurred to me. Of course it is obvious, but I have been thinking very abstractly about the dome (as opposed to pragmatically). I think that is my performer’s privilege: I don’t have to implement any of the technical aspects and therefore, I am a bit naive about the inherent obstacles therein. I did not expect to feel so shy about speaking up about problem solving ideas. I was actually kind of nervous about suggesting my “rain fly” idea about the dome because I felt like 1) I had been out of the conversation for some time and I didn’t know what had already been covered and 2) every single person in the room at the time has more technical know-how than I do. I tend to be relatively savvy with how things function but I am way out of my league with this group. I was really conscious of not wanting to waste everyone’s time with my kindergarten talk if indeed that’s what it was (it wasn’t…phew!). I didn’t expect to feel insecure about this kind of communication. It was a bit of a revelation to think of WonderDome as a new performance platform and, indeed, it is. It is quite unique. I think working with it concretely made that more clear to me than ever before. It is exciting to be in dialogue on something that feels so original. I feel privileged to be able to contribute, and not just as a performer, but with my mind and ideas. This entry was posted in Design, Live Performance, media design, Programming, Theory and tagged Arizona, Arizona State University, ASU, Grad School, graduate school, Open Sound Control, OSC, TouchDesigner, WonderDome on November 3, 2013 by raganmd.